Emmy Mikelson is an interdisciplinary artist. 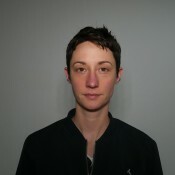 Her work has been exhibited nationally and internationally; recent video screenings include Trani, Italy; Mexico City, Mexico; and Espoo, Finland. In fall 2016, she participated in the Labverde science and art research residency at the Adolpho Ducke rainforest reserve in Manaus, Brazil, and she completed residencies at Signal Culture in Owego, NY, and CultureHub at La MaMa Gallery in NYC during summer 2017. She has published text and artwork in several experimental architecture journals including Nova Organa, KTISMA, and Moinopolis, and she co-authored the publication And Another Thing: Nonanthropocentrism and Art (punctum books, 2016). She teaches Freehand Drawing workshops for the Intro to Architecure summer program at The Cooper Union and she currently teaches at Pace University.